Slime is proud to announce its partnership with Naratyvas to present the official soundtrack to the original motion picture We Will Riot. 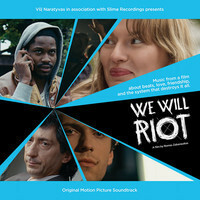 We Will Riot is a film about love, friendship, beats – and the system that destroys it all. The film has been creating a buzz since launching at the Moscow Film Festival earlier in the year, having been highlighted by Hollywood Reporter amongst others. The debut feature directed by Romas Zabarauskas continues to be showcased at film festivals across the world and is due for release on DVD soon. The soundtrack features 25 tracks from the underground Lithuanian music scene, covering a wide variety of styles curated by music supervisor Mark Splinter, ranging from ambient to dubstep, electronica to techno and beyond. Established artists such as the Pitchfork-endorsed Eleven Tigers rub shoulders with young upstarts like the 17-year old Justicious for a fascinating snapshot of a music scene brimming with creativity and flair.